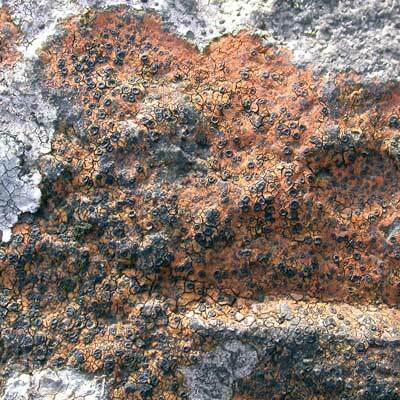 This unmistakable crustose lichen has a characteristically bright, red-brown thallus — sometimes dulling in shaded situations — with flat, black discs with no surface ornamentation. It occurs mostly on hard, siliceous rocks and is especially abundant where the geology includes formations with a high iron or metal-bearing content. It is scattered in suitable habitats throughout Ireland. 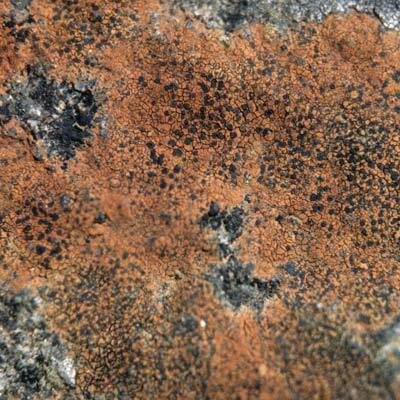 Usually associated with acid rocks that are rich in quartz and/or metal-bearing minerals. Simms, M. J., (2016). Tremolecia atrata (Ach.) Hertel.. [In] LichenIreland.